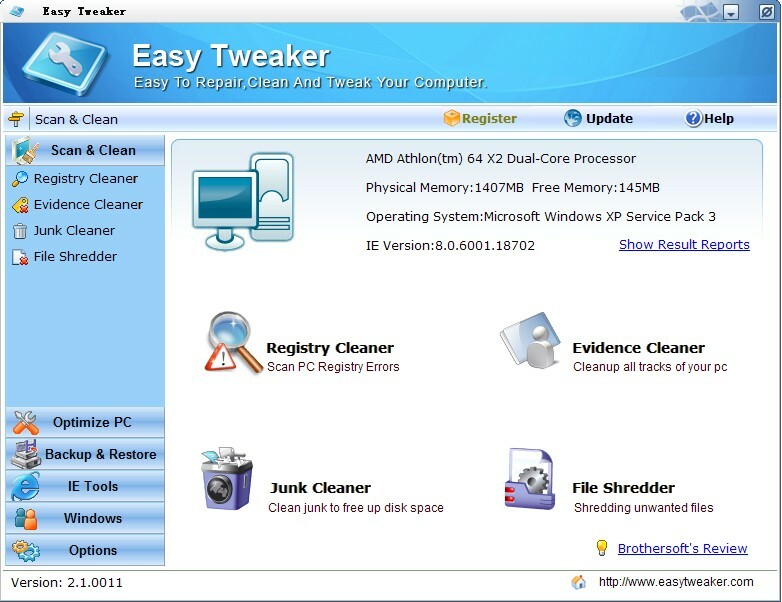 Easy Tweaker will make effective scanning and eliminate common computer faults, such as system slowdown, freeze and crash,blue screen, deadlock, dll errors etc. in addition to these, it is also can safely accelerate the processing speed in effect and help a computer to achieve its best performance with saving the high cost for hardware upgrade.hereof,i am in the hope of that you will be in favor of its security and latest technology. Easy Tweaker will improve your system performance with simple clicks. Registry Cleaner:You could enjoy fantastic system speed after deep scan,comprehensive diagnosis and safe repair. Evidence Cleaner:Protects your privacy by ensuring all traces of your online Internet and computer activities are permanently erased and unrecoverable. Junk Cleaner:Scans and removes almost all junk files from system to provide more free space on your hard drive and allow applications to run faster and more efficiently. File Shredder:With three different shredding levels,file shredder will shred or destroy unwantd files beyond recovery.It completely removes a file or more files from your computer,making it nearly impossible to recover. Startup Manager,Uninstall Manager,System Optimizer,Service Optimizer,Memory Optimizer,Network Optimizer tweaks dial up,modem tweak.With running Easy Tweaker regularly,a quick boost your system performance will have. Qweas is providing links to Easy Tweaker 2.1.0012 as a courtesy, and makes no representations regarding Easy Tweaker or any other applications or any information related thereto. Any questions, complaints or claims regarding this application Easy Tweaker 2.1.0012 must be directed to the appropriate software vendor. You may click the publisher link of Easy Tweaker on the top of this page to get more details about the vendor.